Pretty, well-liked and easy to grow, impatiens are the perfect choice for hanging baskets in low-light conditions, such as inside the typical home or office or on a shaded porch or overhang. The stunning array of colors and attractive foliage mean that impatiens are always gorgeous, whether in or out of bloom. Depending upon your preferences, choose from the taller original varieties or the shorter, fuller New Guinea hybrid impatiens. Their care and low-maintenance needs are identical, although the hybrids can tolerate a higher level of sunlight than their counterparts. Purchase impatiens seedlings or larger young plants. If you prefer the original, taller impatiens varieties, buy several six-pack containers of seedlings. It’s all right to plant them loosely into the pot side by side, so three to four sets should be enough. For fuller, shorter New Guinea impatiens, you’ll only need four to five young plants. Detach the hanger from a 10-inch hanging basket. Partially fill it with a good commercial potting soil so that original impatiens varieties will be positioned at the same soil level that they occupied in the growing containers. Fill the pot to about half an inch from the rim for New Guineas. Remove the “plugs” from the growing containers. Set original impatiens in the pot with their root balls side by side. Move them around so that the color arrangement pleases you before gently firming them into place with potting soil. Plant four to five New Guineas in a circle halfway between the side of the pot and its center. Space them evenly apart. 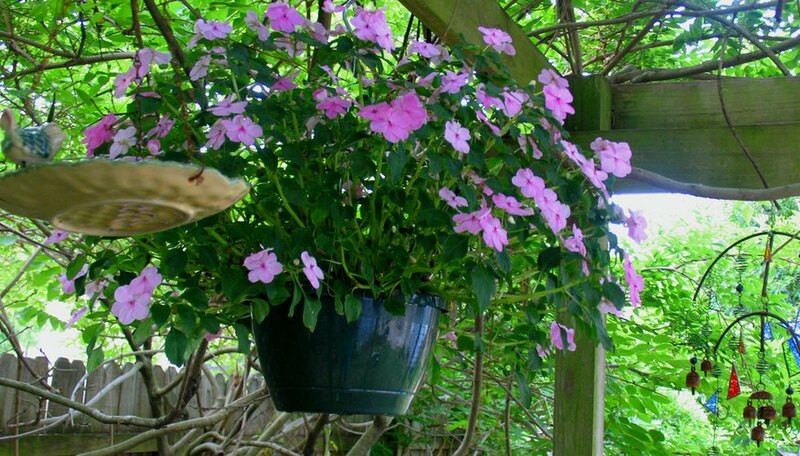 Trim the top third from the tops of all impatiens to encourage fuller growth of both types. Water the soil thoroughly so that it is uniformly moist, but not soggy. Don’t water it again until the soil feels a little dry to the touch. Reattach the hanger to the basket. Suspend the plants in a warm spot with plenty of bright, indirect light for two weeks. Temperatures between 68 and &2 degrees are best after immediate transplant of all impatiens. Sustained temperatures over 85 degrees will slow flower production and cause the plants to produce smaller blooms. Feed the impatiens two weeks after transplanting with a good water-soluble fertilizer. Continue feedings throughout the growing season per the manufacturer’s recommendations. The basket can be moved to lower lighting conditions if need be, because the transplants are now strong and adapted well enough to tolerate them. Continue to water enough to evenly moisten the soil when the surface begins to feel dry to your touch. Cut back original types as desired when they become leggy.